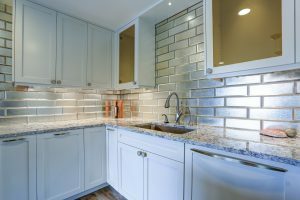 Vanity tops generally do not experience the same level of usage as kitchen counters, but you may want them to be flexible as well as functional. The recent trend of bathroom remodels indicates that homeowners are looking for durable, stylish options that require minimal maintenance. Quartz countertops are solid surface materials that can be sleek and sophisticated or hip and trendy. Although Quartz is manufactured, the contents can often be more than 90% natural, with binding agents taking up the remaining 10%. The manufacturing process enables the production of a wide range of colors and styles. Because it is predominantly a natural stone product, it has many of the same qualities that make granite and marble desirable. It has a rich, luxurious finish with a depth that is typically unmatched with man-made materials. The non-porous characteristics of quartz countertops make it more resistant to staining by makeup or bathroom cleaners. However, it’s recommended that you avoid the use of abrasive cleaners as they can dull the surface. It is more forgiving than granite or concrete, so it may not crack or chip as easily as the natural materials. Scratches can be buffed out with a fine gauge sandpaper. The non-porous nature of the material means it is not a haven for viruses or bacteria. Quartz vanities do not need to be sealed or resealed, unlike granite or marble. The style of quartz vanities may be viewed as contemporary. For homeowners that have a traditional style, this material may not fit the rest of the décor. However, for those who revel in an eclectic style or prefer the vanity to offer an unexpected pop of color, this solid surface option may be the ideal choice. Quartz countertops in the bathroom can add the elegance and beauty of stone to your bathroom vanity. Experienced installers can ensure the seams remain as unobtrusive as those in granite and other natural materials. Ask about using the solid surface on the floor, walls or in the wet areas of a master bathroom for a serene, spa escape.